Set amidst a peaceful, private redwood grove, tucked away from heavily-forested West Country backroads between Sebastopol and Occidental, family-owned Freeman Winery and Vineyard might have coined the phrase of a true 'hidden gem'. For unless you know exactly where you're headed, this high end, small production treasure trove of a quite extraordinary selection of cool climate, hand crafted Burgundian-style wines remains hidden from even the most ardent of wine tasting enthusiasts, those well used to taking the road less traveled. These are my favorite sorts of wineries to visit, to pause for a taste and a talk with unhurried wine making proprietors. People who are in touch with each and every element of their wine making process, from the meticulous selection of the best of top quality fruit from the area to the peculiar idiosyncrasies of the winemaker's preferences in harvest and production, barreling and bottling stages of each fine wine's journey from vine to table. A subtle impression of owner and winemaker Akiko Freeman's innate Japanese sense of order and place is evident throughout the winery and its serene, gated grounds. I had the sense as I drove in that this small, elegant winery, its beautifully restored production barn and modest, stone-front caves were every bit an extension of the Stanford University Italian Renaissance Art History Major and MBA financier husband Ken Freeman's stylish, modern, home that presides over the property from behind a high canopy of foliage above and beyond the hilltop. Clearly everything was at one with its surrounds, even the 6,000 sq ft caves that had been blasted into the hillside and carefully carved out to store the Freeman's 500 barrel capacity wines, back in 2004, looked like they'd always been there. This well hidden, four-acre site, located along remote Montgomery Road, Sebastopol, had, in fact, been abandoned as a fledgling winery, set amongst apple orchards, back in 1978. With its 2,000 case wine permit still valid in Sonoma County, the Freeman's fell in love with the property in 2001 and along with an additional four acre purchase of orchard land surrounding their prized find, set about the realization of a long-held dream to launch into cool climate, artisan winemaking. "It was always our goal to make a more elegant wine that would pair well with food," said Akiko, as we walked towards the large, open door to the caves. The couple's first wine was released in 2004, made from fruit from none less than the 'Queen of Pinot' - Merry Edwards' acclaimed West Country fruit. Starting as they meant to go on, the Freeman's had little problem in selling cases of their inaugural Pinot to friends and business associates, intrigued with Pinot following the release of the Sideways movie, and quickly impressed with the quality and character of the complex and distinctive varietal. From the first releases of its award winning Sonoma Coast Pinot Noir, ranked for 2009 at Number 22 amongst the Wine Spectator's Top 100 Wines in 2011 as well as listed amongst Food & Wine Magazine's Best 30 Pinots in the World, plus Akiko’s Cuvée and a Chardonnay, Freeman wines continue to attract international praise and have found a home on many of the world’s most discriminating wine lists. Renowned consultant winemaker, Ed Kurtzman and associate artisan winemaker Eric Buffington have worked closely with Akiko as she fine tunes her own winemaking expertise, gradually taking over the reigns as Kurtzman and Buffington make their own signature label small production wines. A petite, extremely poised, precision winemaker, Akiko explained how she prefers not to expand the winemaking operation into a larger, commercial enterprise, maintaining attention to detail with her small, close team and open for tastings only by appointment. Without a tasting room to staff, the Freemans are able to offer special tastings on a wooden ledge positioned over wine barrels in the very heart of the caves. Visitors are welcome to bring a picnic to enjoy with wine purchases, at bench tables under the trees outside. "Everyday we get emails from people all over the country, especially Texas, New York and Chicago," said Akiko. "They've tasted our wines in top restaurants and purchase from us directly online." The list of Michelin three star restaurants that feature not just one or two, but most of the Freeman's line-up of eight unique wines is a dream come true for any small production winery. You'll find them on the wine lists at The French Laundry, Daniel, and Alain Ducasse, Dry Creek Kitchen, Gary Danko, Tra Vigne, Underwood Bar and Grill, West Country Grill, Post Trio and many more. How did this unassuming winemaker score such stellar results with such a relatively young operation? "It's all about the food and how well our wines compliment a meal," Akiko explained. "Sommeliers love our wines." Though the Freemans have planted estate fruit - a couple different Pinot Noir clones, its bottling is reserved for the near future. Akiko recounted her first meeting with renowned Russian River grower, Marcy Keefer, back in the early 2000s. 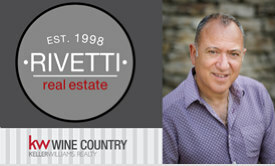 "We'd been impressed by her incredibly maintained vineyards and had requested to purchase fruit." Keefer and her son Craig Strehlow supply grapes to notable Pinot Noir specialists including A.P. Vin, Failla, Kosta Browne, Loring Wine Co., Pali, and Siduri. Keefer, a perfectionist when it comes to the use of her fruit, was apparently not much inclined to accommodate an unknown newcomers' request. Undeterred, the well-mannered, patient and competent Akiko invited her to taste the couple's first attempt at winemaking and the rest is history. Keefer and Strehlow sold them a first, small amount of fruit in 2002. "After we barrel tasted together, we were granted permission to buy more fruit the next year!" said Akiko. With its flowery notes and hint of tangerine peel, I tasted Freeman's outstanding 2010 Keefer Ranch Pinot Noir, the winery's only single vineyard-designated Pinot Noir. Freeman's Sonoma Coast Pinots that pair so ideally with mushrooms, proscuitto and quail are crafted from four or more premium vineyards producing tiny fruit with concentrated flavors, grown closer to the Pacific ocean. A 2010 Russian River Pinot Noir, built to age with its ripe berry fruit and forest floor aromas is a blend of four different vineyards located closer to the winery. Not surprisingly, five per cent of the winery's production, with its hints of Asian spice, cinnamon, anise and nutmeg, ships to Akiko's native Japan. "It helps to speak the language," she said. A 2012 fruit-forward Ryo-Fu Chardonnay, featuring Japanese characters on the label, translates appropriately to 'cool breeze'. Fruit for the Chardonnay is also sourced from the Freeman's favorite growers at Keefer Ranch. Akiko's Cuvee Pinot Noir is a special blend selected from specific barrels by the winemaker herself and a tasting of the 2010 revealed a lush, complex wine of ripe fruits balanced with toasty, earthy undertones and while excellent right out of the bottle, will only get better with time. Freeman wines range in price from $44 to $54 - good value for money when you're looking at as much as $160 for one of these exact wines when featured on the high-end wine lists of restaurants such the French Laundry. Montgomery Street is off winding Bodega Highway, but don't head out there unless you are expected! I visited from the Freestone direction, fortunately for my figure, on a day that the Wild Flour Bread Bakery was closed. I drove past several quirky little eateries and shopping spots en-route along Bodega Highway, a portion of the country road that I had never traveled before. Email eric@freemanwinery.com or call (707) 823-6937 to ask about private tastings. Don't miss a special opportunity to dine with the Freemans during the West of the West Wine Festival, Friday, August 3rd, 2012. This multi-course meal also featuring wines by Joseph Phelps will be served in the Caves at Freeman Winery, and costs $150 per person.